i-piggy has three great Partnership options, each lets you reward member customers with points and each includes i-piggy’s smart Customer Communications features. Depending which option(s) you choose, you can be up and running in as little as half an hour – giving i-piggy points and posting offers & deals that members can see immediately. i-piggy provides you with books of vouchers of different points value which you activate in your i-piggy account. Give vouchers to customers (Members) who then claim their points via their App or the web. You can post short notice offers that can be seen by members in your town scheme – as well as by visiting members from further afield. Who you give points to, is fully accounted for and you can use the i-piggy Statspack to analyse your customer data. This option is ideal for Partners wanting ‘zero tech’ implementation and it’s suitable for anyone, including small traders who don’t use EPOS terminals or take payments by card – but who would like to create and maintain a communication link with their customers. Use the Partner App on your smartphone or tablet for access to all your key i-piggy account functions. To give points, just scan a Member’s Points Card (the QR code) with the App and enter the transaction value. i-piggy calculates the points to give according to your rule settings and, on confirmation, adds them to the Member’s Points Card. Another function enables you (optionally) to accept i-piggy points as payment in lieu of a cash. All your points transactions and their value are fully accounted for and accessible on the Partner App. This option is ideal for moderately busy outlets where you have standard wifi / mobile network coverage. It’s secure, accountable and it gives you the option of additional revenue by accepting i-piggy points. Designed for use at busy outlets, this option uses a separate card scanner installed at your checkout(s). Points are calculated and given automatically when the Member’s Points Cards is swiped. The i-piggy scanner is available for monthly rental and there are bespoke options for integration with stock stock files and reporting at sku level. Recommended for busy shops including multiple checkouts, where points must be given quickly with a single swipe. Multi-Purpose: What Types of Business benefit from i-piggy? Independent retailers and SMEs (shops, hotels, service companies etc.) who want to take advantage of a low cost rewards programme to attract customers and improve marketing via integrated CRM features. Partners will generally be associated with a town or area-based scheme to focus on local catchment. Organisations who want to incentivise a particular activity or behaviour (e.g. to complete a course or activity, pay a bill promptly, arrive on time). i-piggy points area a great way of doing this – providing the platform and analysis capability. Manufacturers and producers who wish to promote their products or services with i-piggy’s ‘points back’ options – (e.g. 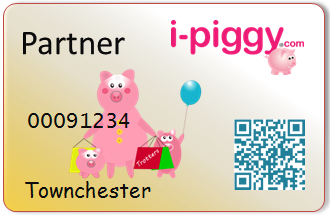 i-piggy QR points codes on labels, inside wrappers ) with access to demographics, temporal and spatial data.